INNOVATING A BETTER TOMORROW, TODAY. Electrical construction and automation services built to meet your needs. FIND US AT IAOM CONFERENCE IN DENVER! Visit us at Booth 615 April 15-19 at the IAOM Conference in Denver. Find the solution to all your electrical construction, engineering, and control systems needs. Opportunities for growth, one of the best safety records, and benefits that put your family first. Get the latest company news, updates in technology, innovative solutions, and best practices. We meet the electrical and automation needs of companies around the world. Our story began in 1953, when John A. Franken started Johnny’s Electric; a business that installed televisions in homes. Over the years, we expanded our service offerings and gave ourselves a new name: Interstates. 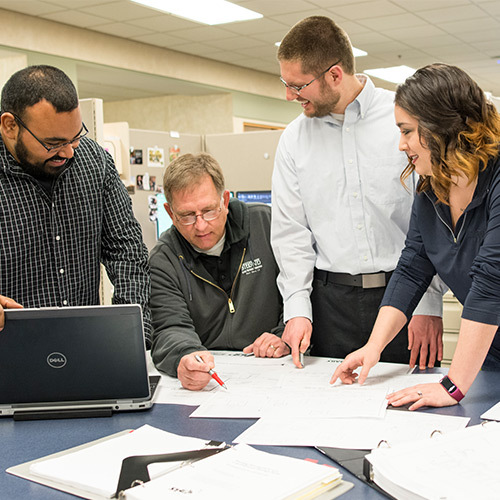 What started out as a small electric company, evolved into an organization with over 1,000 employees who thrive on tackling your most complex projects, and strive to develop innovative solutions built to meet your needs. Contact us now! Call (712) 722-1662 to speak with one of our experts or click the button below to send us a message. Our team is ready to answer your questions and assist you with your next project.